Sometimes the journey of uncovering the details of an artist's career can be extremely frustrating. Such was the case with Canadian illustrator, Rex Woods. After I wrote about Woods in May 2007, several people contacted me... some asking for additional information, others offering tiny clues... but a clear path to a proper Rex Woods biography did not seem imminent. It was maddening that an artist of Rex Woods' stature (he has been called Canada's Norman Rockwell) would have fallen into such obscurity. At one point even the ROM, which has a collection of original art by Rex Woods (two examples below), contacted me to ask if I could help with biographical info. Well I'm very pleased to say that the seeds planted in that May 2007 post have at last born fruit. We began the task of telling Rex Woods' story almost three years ago. Today, we finish the job. Reginald Norman (Rex) Woods was born in Gainsborough, Lincolnshire, England, in 1903. 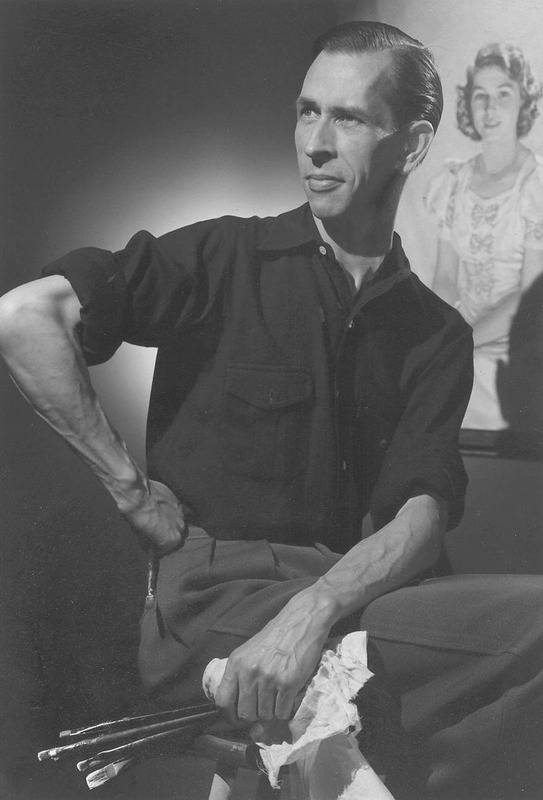 He came to Toronto, Canada in 1920, and studied at the Ontario College of Art. After graduating Woods worked in various Toronto art studios. In 1927 he married Jeanne Etheldra Mott; a ballet dancer with the Metropolitan Opera Company. In the 1930s he decided to strike out on his own. He quickly became one of Canada's most successful and sought-after illustrators. 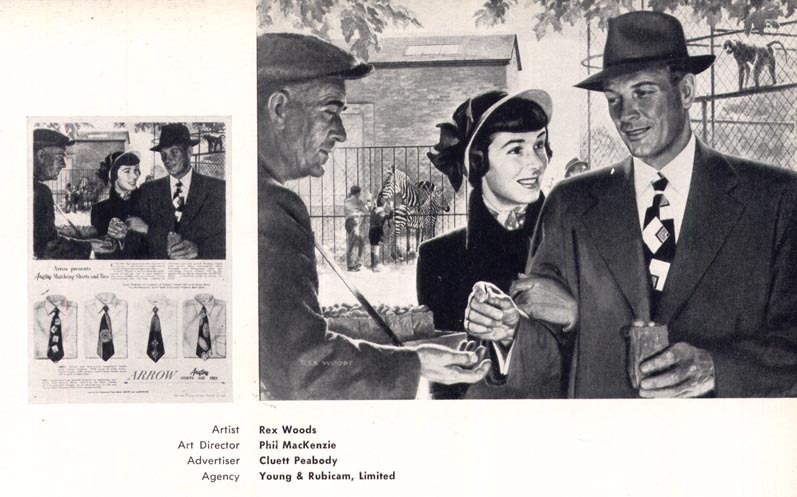 Woods was tremendously well received in Canadian commercial art circles. 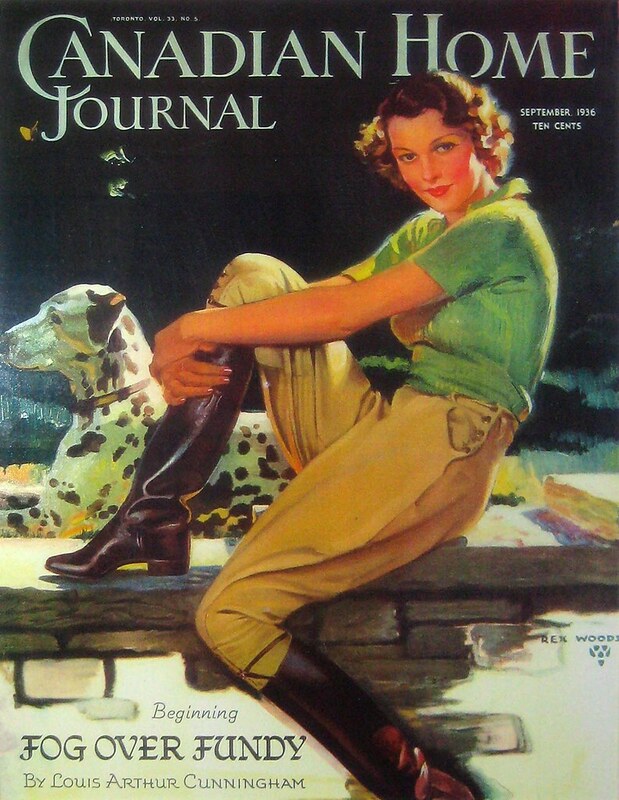 He regularly contributed covers to popular magazines like Maclean's and Canadian Home Journal, and drew advertisements for many Canadian companies. 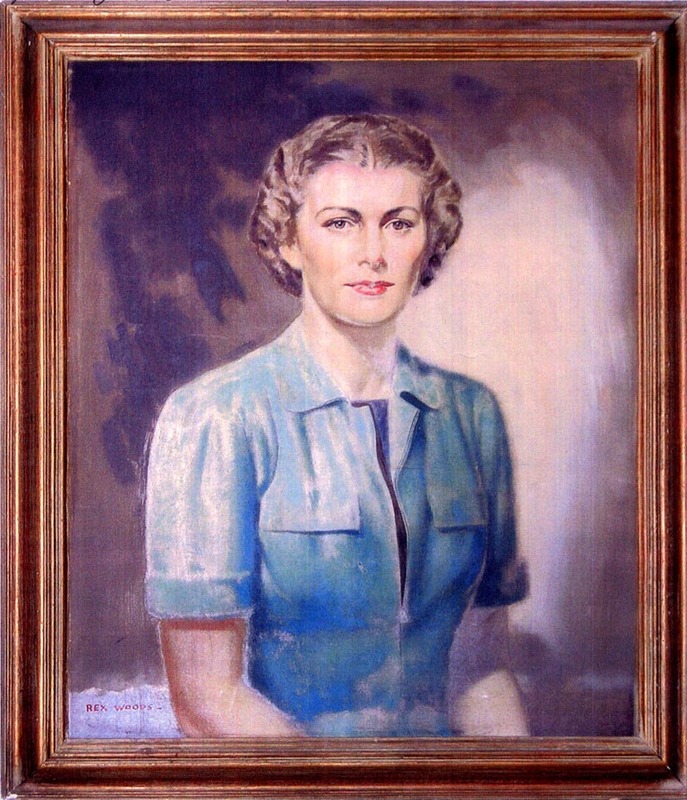 He painted one of the most famous faces in Canada; "The Macdonald's Lassie," which appeared on the tobacco company's popular Export "A" brand of cigarettes for decades. 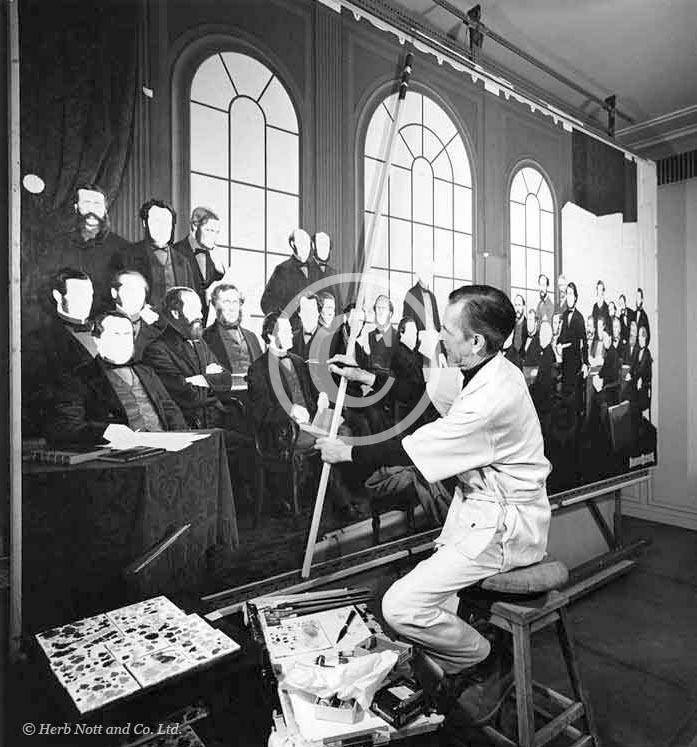 One of his most famous works is a giant group portrait of the Fathers of Confederation, actually a copy of a painting by Robert Harris destroyed when the Parliament Buildings burned down in 1916. 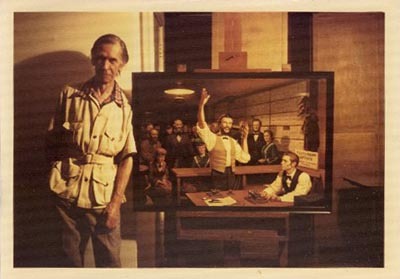 Woods' recreation was commissioned by the Confederation Life Insurance Company (Woods added three figures to the original composition) and was donated as a Centennial gift to Canada in 1967. It hangs in Parliament. All of this information came to me not through any great research on my part - but through the efforts of a gentleman named Mike Gourley. In 1970, Mike, a truck driver, was picking up a load of flour at the Robin Hood Co. in Moncton, New Brunswick. On the loading dock he noticed a load of stuff that was bound for the garbage dump... and among the items being thrown out was an original oil painting. "I asked the shipper if I could have the picture," Mike wrote to me. "He said I could have it as it was going in the landfill... so I've had it all this time. Two years ago I was disabled so I had time on my hands and I started checking this out. I went to the museum in St. John, N.B. with the painting and a lady said it was a wonderful painting and an original. Then I went to the Ottawa, to the library and archives. There was nothing like what I have." 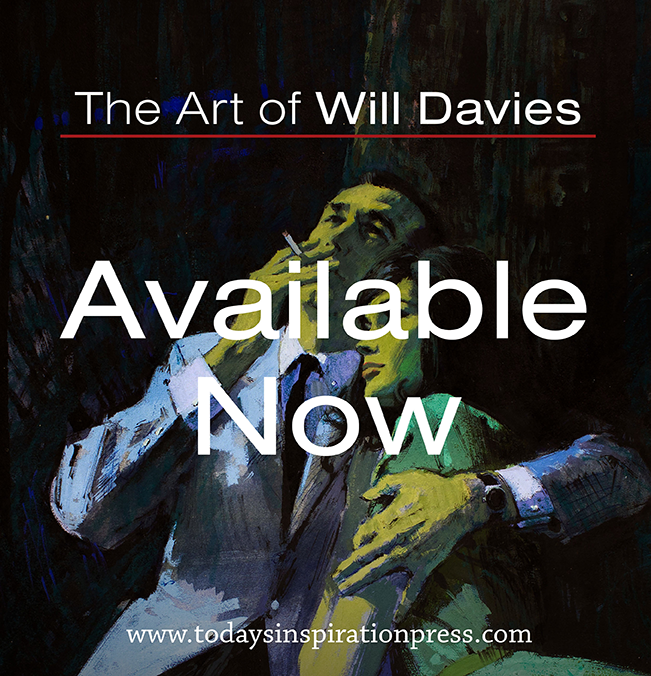 "I was very surprised that I could not find any record of this painting in Ottawa. 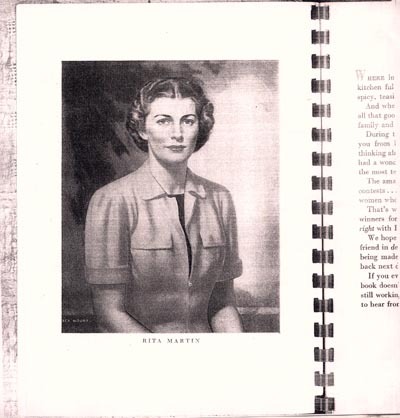 One day I talked to my mother-in-law about this and she was baking... and I just happened to see this lady's picture in her cookbook, put out by Robin Hood Flour in 1947." In the course of his research, Mike uncovered an obituary for Rex Woods from the November 19, 1987 Toronto Star. he sent along a photocopy when he sent me copies of the painting and cookbook page above. Its thanks to Mike that we now have a biographical record of Rex Woods. "Oh my gosh! I LIVE in that building! About a year ago, they hung up a bunch of his prints... I HAVE to talk to my old (retired) super (he still lives here). I think it was the same super... Rex passed in '87. I'll have to see if I can find anything more out! There are also residents living here (though I don't know them) who've been here pretty much since the building was built in '39." "I'm doing a post today about Rex. I'll add a link here when it's done. I've photographed every one of the 20 prints that decorate our walls here!" Below, one of those 20 prints, courtesy of the author of that comment, Lynda Woods (no relation to Rex). "I wanted to let you know about something quite exciting! I called up my old super today, and he was indeed the same one who not only knew but was good friends with the Woods'! He told me a little over the phone (such as that Rex and his wife moved here, I believe, before the building was even completely finished, in '39) -- but he wound up lending me a couple of articles he himself wrote (I believe one was published in the Toronto Star in '87, after Rex's passing). Using those articles, I'll shortly be doing another post on Rex, as they contain quite a few tid-bits... some personal facts)! I'll let you know once it's up." * Many thanks to Mike Gourley for his generosity in sharing the details of his research and the related images. In his correspondence, Mike added, "If you have someone who is interested in buying the painting, I'm OK with that. The Antique Roadshow was in Moncton a couple of years ago and a lady offered me $2000 for it. Maybe I should have taken it." * Many thanks to Lynda Woods for making us aware of the existence of the Rex Woods prints and for posting them on her blog. We'll look forward to hearing more about Rex Woods from her in the near future! * Many thanks to Flickr member Lone Primate for allowing me to use some of his shots of the Rex Woods originals near the top of this post. * Finally, thanks also to Julie Clark, who shared the photos of the artist at the top and near the end of this post. Julie's mother and Rex Woods were cousins. 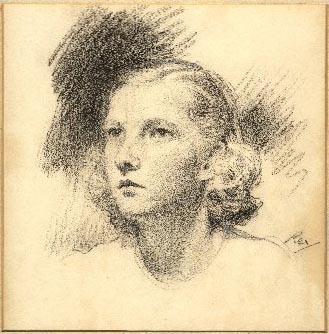 This last image is a drawing Woods did of Julie's mom in 1936. I'd highly recommend anyone who lives in the Toronto area to go check out the Rex Woods paintings over at the Royal Ontario Museum (including several featured in this post). They really are stunning in person! Love that photo of Rex, now that's how an artist SHOULD look. 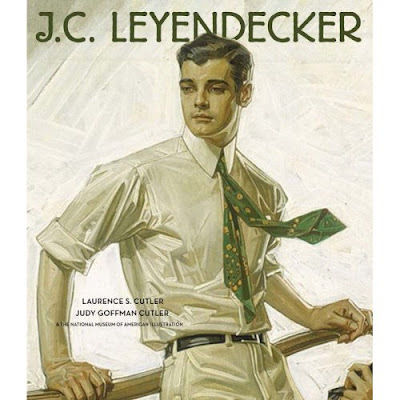 Don't know about you,but I see a distinct Leyendecker influence in his work, which ,by the way, is top quality. but it's almost completely invisible upon reproduction. It's a shame that we don't see very many illustrators in art museums these days; I feel like I learned so much just from seeing the nuances of how these guys laid their paint down. WOW! 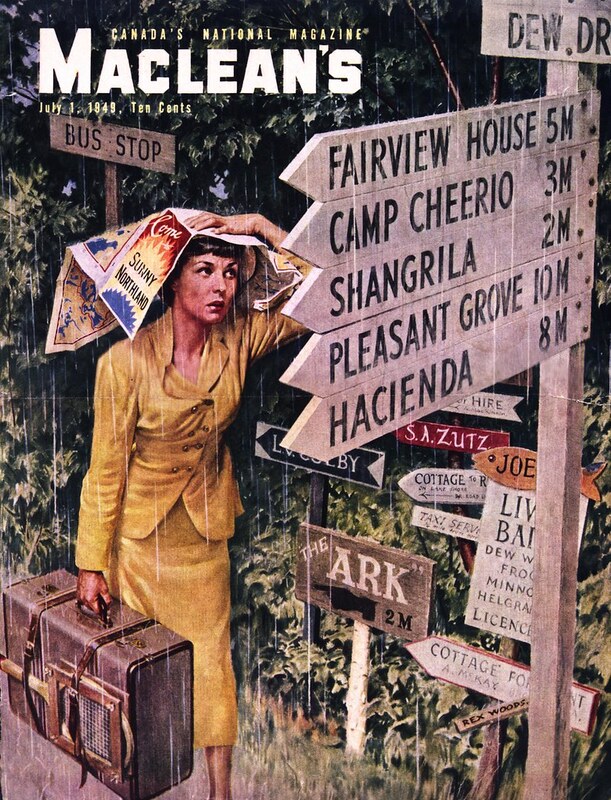 Never saw his Rex Woods illos before, but what a great painter! Not only is he academically solid, but great taste and excellent design. I echo Eric Overton's disappointment in not seeing illustrator's work in museums. I think all the Society of Illustrators should pool their illustrations for on going traveling shows to major cities in the U.S. and Canada. Seeing the originals is so much better than looking at a reduced reproduction, that usually isn't that accurate. Another great find Leif! Wonderful post, Leif! I hadn't realized you'd found out quite that much more about Rex! Great, too, to see pics of the artist himself! I'm not sure how much more I can add (one of the two -- fairly long! -- articles I've borrowed is mainly to do with Jeanne, actually), but there should be a thing or two worth making note of, I'm quite sure! Many thanks for mentioning my own post (had I forgotten to add a link initially?) -- and I'll be sure to let you know when the second one is up. There sure is a lot of interest in Rex these days! Thanks for getting it together, Leif. 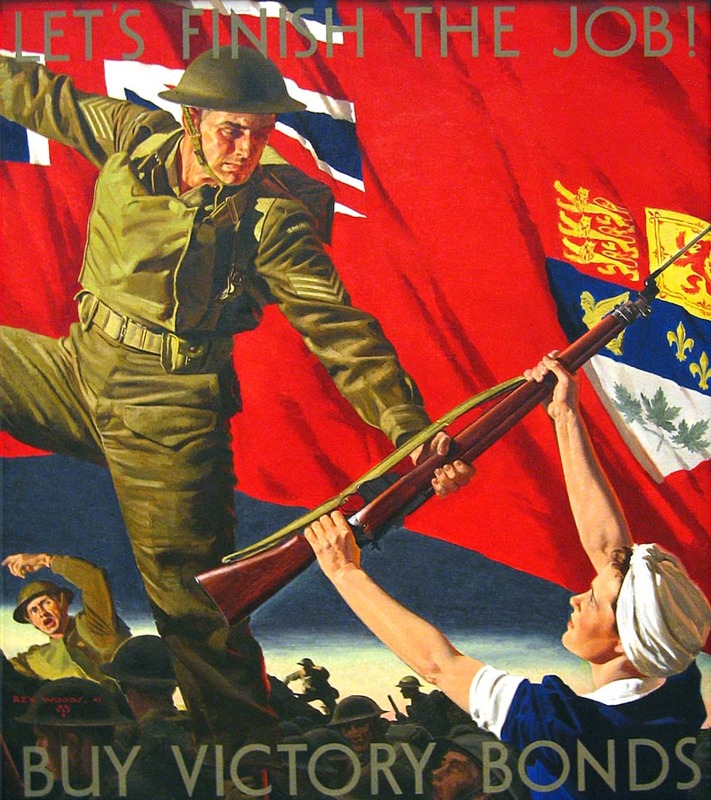 Just want to build on what others have posted here: Rex was indeed a bit of a shameless copycat of Leyendecker - as you'll see in some of the examples the ROM has. Second, the Society of Illustrators does loan pieces for exhibitions elsewhere. The reason we don't see so many illustration exhibitions is that fine art curators still haven't quite got their minds around the idea yet. Boy is that changing fast though! Never heard of him - another discovery. "Canada's Norman Rockwell" seems quite apt. Great pleasure to look at these. My personal favorite is the first one; the rainy Macleans. Enjoyed Rex' signature there - another wooden plate. Thanks, Leif. Back to sanity! I can almost echo Tom's comments. New to me, but that's happening more and more lately. I'm still not clear what medium he used. Probably oil, and his brushes are not for gouache....but some of his work looks like gouache. Whatever. Just marvelous work...and I'm amazed by those early dates on the magazines. 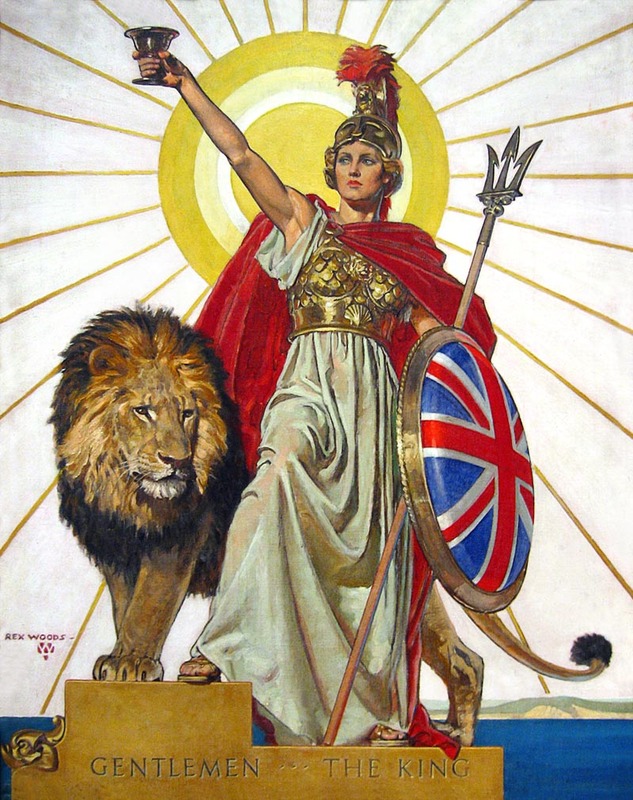 The heroic lady with the lion is just too much! Gracias, again. I worked with a lady in Toronto from 1972-74 who claimed to be the Macdonald's lassie! Her married name was Ethel Coles. She was an older lady, of course, but the resemblance to the Macdonald's lassie was uncanny. I have always wondered if this was true. Just saw/introduced to Rex Woods' art at the Royal Ontario Museum just the other day. I was completely moved by his work. Enough so that I came home and had to find out more about him. I am happy to have stumbled upon such a great artist's work. As the previous posts have eluded, the pictures online do not do the actual paintings justice. I appreciate all the information that has been provided here. I was Rex and Jeanne's dentist from 1975 and truly enjoyed their visits to my office. Their zest for life was an inspiration to me. Jeanne would be so enthusiastic about the work Rex was doing and would tell me about how excited they were about upcoming projects: she handled the research. At one time, not knowing how accomplished Rex was I asked him if he would like to come along to a life drawing class I was attending. He graciously declined. Years ago, while waiting for his turn in my office, he entertained a youngster by drawing a picture of a bunny rabbit... not all that well done but good enough for me to trade the kid for it. I think I offered her a toothbrush in return. Recently an article appeared in the Toronto Star with a photo of Rex's painting of the Father's of Confed. but instead of a credit going to Rex, it had the name of the guy who took the photograph. Heresy. I promptly wrote to Rick Salutin pointing out the slight to a great Canadian artist. I didn't know Rex immigrated as early as 1920; he spoke with an English accent... and Jeanne had a New England accent. I too have found a Rex Wood piece. 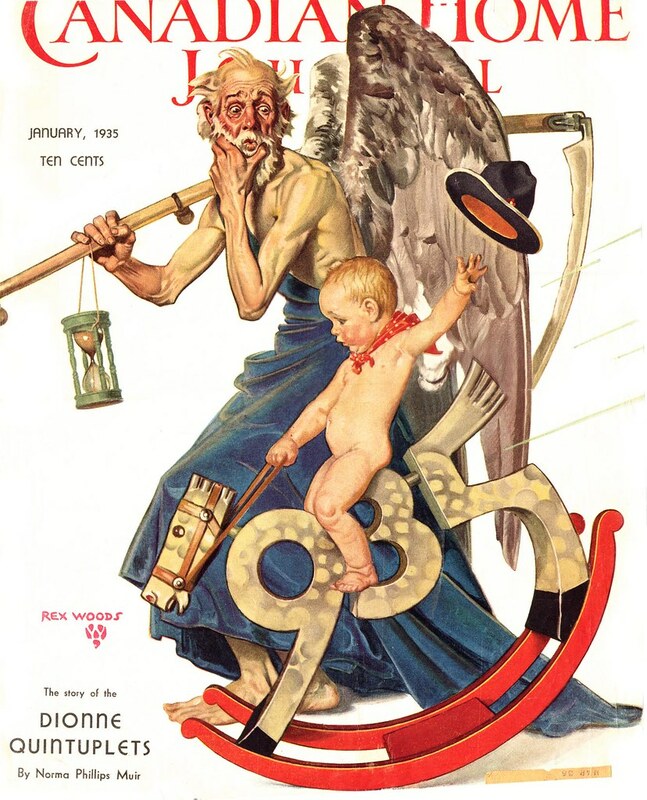 It was painted for the American Life Insurance Company and was used for their 1938 calendar. The print is on satin and reproduced by their permission. Does anyone have any idea where to find info on this? 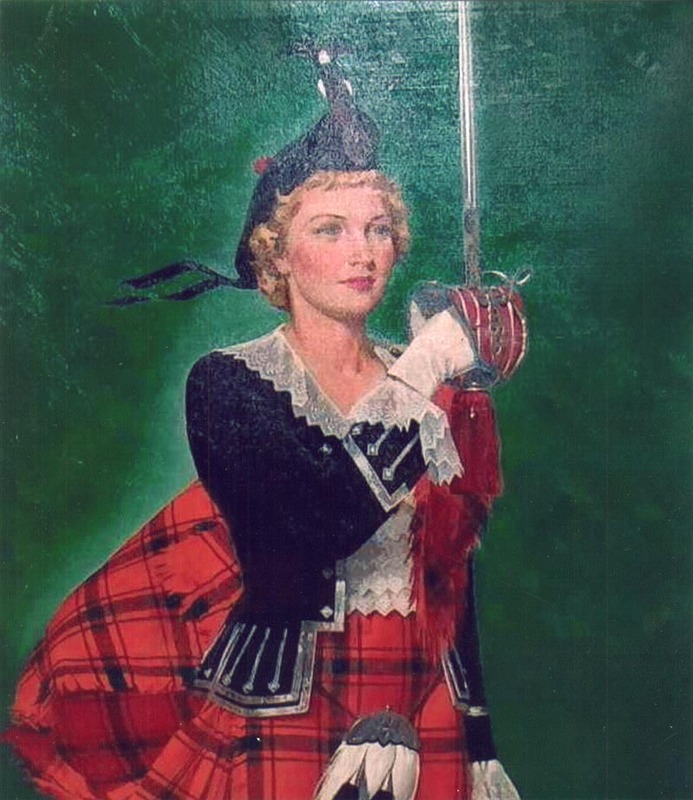 I have been trying to find an image / print online of Rex Woods' Macdonald's lassie as used by Export A to be framed. Any guidance? I have two oil paintings by Rex woods of confederation shipyard.. I am interested in selling - looks like museum pieces. How do I go about it? How much would a print cost today?